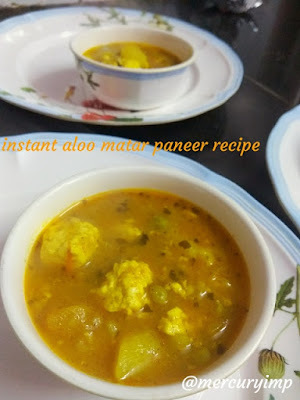 Long gone are the days when making aloo matar paneer was a big task for me. Today, it is a breeze to make just about any meal, thanks to OPOS. In the pre-OPOS era, it was all about sauteeing, sauteeing, and sauteeing the onion-ginger-garlic and tomato mix to add taste to any gravy. Today, we do not need to do any sauteeing and standing in the kitchen before the stovetop. Just layer all the veggies and you are done making a lip-smacking curry base for any recipe - be it aloo matar paneer, paneer korma, paneer badami, kadahi paneer, or any non-veg item. You can take my words for it. If you still do not believe me, then you have got to give this finger-licking aloo matar paneer instant recipe a try. You will be sorted for lifetime. What's so special about Instant Recipe for beginners of Aloo matar paneer? It's a perfect blend of spices, starch, and dairy! On top of it, the recipe uses 5-minute paneer OPOS way. Let's come back to my collection of healthy paneer recipes. Yummy is the right word to go with this lip-smacking aloo matar paneer curry recipe for beginners. Aloo matar paneer has always been a favorite with vegetarians. Paneer or cheese stays on top of the vegetarian's favorite meals.Rich in proteins, paneer adds richness and thickness to any gravy. You can make just about any meal, snack or dessert with paneer. 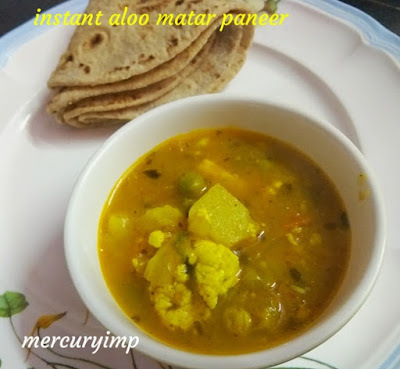 Let's come back to the aloo matar paneer recipe instant that you can make in a jiffy. I gave 4 whistles, as I had kept potato pieces a little bigger than normal- released pressure, mixed, and then added paneer marinated with a little amount of salt and black pepper. Added the pot of hot water which was kept as PIP. Enjoyed with autolyzed oats roti or diabetes-friendly roti :) No, I am not a diabetic, but I prefer to keep everything healthy, so my choice of ingredients revolves around health. I have followed OPOS technique, which is patented by Rama Krishnan - the OPOS mentor. OPOS recipes are simple, hassle-free, quick, healthy, and oh so yummy. In order to start with OPOS, you need a 2 or 3-liter pressure cooker. Add 1/4cup of water to it and set on high heat. If your first whistle comes between 1 and 2 minutes, your pressure cooker is all set to join the OPOS bandwagon.